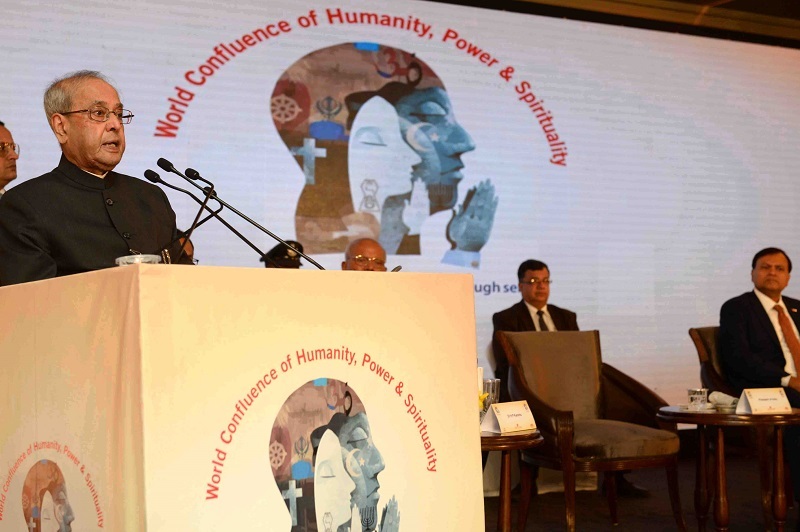 1.I am indeed very happy to be here at the inaugural session of the ninth World Confluence of Humanity, Power and Spirituality, organized by ASSOCHAM, Srei Foundation and the Times Group. This conclave is being conducted annually since 2010 to spread the message of inter-faith peace and harmony, to ignite the human spirit, and to harness the potential of human beings towards selfless service. 2.The theme of this convention, "Sach Bharat: Spirituality at Work”, is of immense relevance. Spirituality is important for any individual. At times, it is confused with religion but spirituality carries a deeper meaning in its strong connect in our daily lives, including our workplace. Being spiritual is being devoted, including devotion to one’s work. Working harder for the growth of the nation is an act of devotion in itself. With an august gathering present here, I hope this forum would help in propagating such a message. 3.Human life is full of challenges and contradictions. On the one hand, we are continuously racing against time running towards fulfilling our life ambitions. On the other, we are trying to seek answers to questions about true happiness and real success. Amidst work pressure and the anxiety to prove ourselves, we are also driven by the desire to look for peace of mind and achieve inner satisfaction. These diverse threads are not very difficult to integrate but to comprehend them, we have to delve deeper to understand the true meaning of life. This platform, to my mind, should help us to clarify some of our doubts and concerns. 4.Spirituality forms the support base of the moral and social principles which has made mankind civilized. We belong to a country and a civilization that has always attached great importance to spiritual thought. It is one of the many gifts India has given to the world. From ancient times to the modern age, India has been a guiding light among nations when it comes to spiritual leadership. Lord Krishna, Lord Ram, Lord Buddha, Lord Mahavira, Emperor Ashoka, Kabir, Guru Nanak, Ramakrishna Paramhansa, Swami Vivekananda, Mahatma Gandhi - throughout our history and in our present - we have been blessed with great spiritual thinkers and teachers. This is a land whereDharma Rajya has existed. This is also the country that fought its battle for freedom using non-violence. This rich heritage is among our greatest strengths. 5.So what is spirituality for us today? I believe it is an India that lives by the values we have always upheld through our history; an India that embraces diversity, that is open and inclusive, where people live with the values of inclusion and tolerance. It is also an India where people strive for achievement, for personal growth, and for balance in life. 6.Our philosophers and spiritual thinkers have spoken of the need to achieve a higher level of being. Spirituality awakens that inner power in human beings. That power also helps people to face difficulties in their lives. Every religion imparts the lesson that we can surmount our problems and challenges only with truth. This conclave ofSach Bharat, according to me, should re-ignite our minds to maintain our roots in truth while we pursue economic prosperity. 7.Sach Bharat is an imperative for our country today. We swear by ‘SatyamevaJayate’, which is inscribed in our national emblem. It means "truth wins”. Our scriptures say: "God is Truth and Truth is God”. We must always stand for truth as only then can victory be ours.Sach or truth is the only basis of our progress. Truth was there at the beginning of the universe. Truth alone will be there at its end. Truth is the basis of our existence. Swami Vivekananda once observed and I quote: "You can get rid of everything for the sake of truth, but you cannot get rid of truth” (unquote). 8.As our sages and thinkers have often said, India has enlightened the world with spirituality and truth. But India also needs to strive for greater economic prosperity to eradicate backwardness and poverty. Development of industry is central to economic progress. The success of our industrial sector depends on the efficient use of our resources including labour as much as the productive use of capital. A happy and satisfied workforce is the key to a healthy industrial eco-system. We have to prepare our manpower by instilling in them a culture of hard work, sincerity and dedication. This is where, I believe, spirituality has a role to play. 9.At the workplace, being spiritual is to express the full potential of our souls at work; remembering always that God is our only employer. Spirituality gives a superior meaning to whatever we do. If we approach work with the same piousness as we have when we worship God, we will experience a sense of being uplifted; of being connected to a greater power. If we think of pleasing God through our work and that God is watching us, our work will have a different quality and meaning. We will then move closer to perfection. Asakto hyācharan karma param āpnoti pūruṣhaḥ”,which means that"Therefore, O Arjuna, always perform your duty efficiently and without attachment to the results, because by doing work without attachment one attains the Supreme Person” (unquote). 11.In today’s world which is becoming more and more insular, it is imperative that we use spirituality to guide us in our thoughts, deeds and actions. Spirituality shows us how to treat others. All religions profess values for reformation of the human being. The Gita says and I quote: "Perform all work carefully, guided by compassion” (unquote). Spirituality means embodying kindness, compassion and selflessness. If these values flourish in our citizens, offices and factories and in our work culture, they would become happy and productive workplaces. Their effect will transmit to the wider community. At the organizational level, companies have to look at how they are upholding their values. How congruous are their actions with regard to what they espouse as their values? How ethical are their actions and how fair are their practices? What behaviours in their employees are they rewarding? Are these behaviours consistent with their values? Is there trust within the organization and is the organization trusted by the outside world for its integrity? These are some of the very basic questions which we will have to answer ourselves. 12.Organizations have to ensure that their culture- the way they do things- promotes a spirit of inclusion and collaboration. Working towards self-actualization has to be a way of life for the employees. An organization that believes in and works towards spirituality at the workplace will ensure that its people have every opportunity to self-explore, seek a higher purpose and behave with others with kindness, compassion and selflessness. 13.India is a nation with a large young population. The youth is our greatest strength and our beacon of hope for a brighter future. We have to ensure that our rich civilizational values are instilled in them. If business leaders and other stakeholders come together, we can actualize the potential of our bright young population. As we strive for higher levels of socio-economic development, we need to ensure that we remain connected to our values. It will guide us to a path of growth that is rich in spirit and wisdom. I hope to see this conference bring us closer to this vision. With these words, I conclude. My best wishes to you all for a bright future!